US based Energy company is using HashCash Blockchain network HC NET to make payments to vendors in China, India and Philippines. New York, NY, March 27, 2018 --(PR.com)-- Energify World announced today that it has become one of the first energy companies to conduct live vendor payments on a blockchain network. 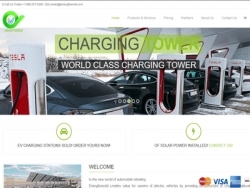 Energify World manufactures Solar panels and electric vehicle charging stations for US customers. The company says that Vendor Payment is the first of several blockchain applications that it intends to implement. Blockchain based supply chain management and part tracking is another area of interest. IOT and managing off-grid solar networks is also where the company thinks Blockchain has potential in. Energify World is a renewable energy company that manufactures ultra efficient solar panels and world class charging stations for Plug-in-Hybrid and Electric Vehicles. The company envisions a world where people drive high performance cars powered by clean energy sources. It strives to create an environment where electric vehicle is the transportation of choice for auto buyers. HashCash Consultants started as a Blockchain Consulting Company in California in 2015. Today, HashCash products enable enterprises to move assets and settle payments across borders in real-time using Blockchain Technology. Banks, Corporate Houses, Domestic Payment Networks, FinTech Companies, and Currency Exchanges use the HC Network for Retail Remittances, Corporate Payments, Trade Finance, and Payment Processing. HashCash has 100+ enterprises using its products in 26 countries.